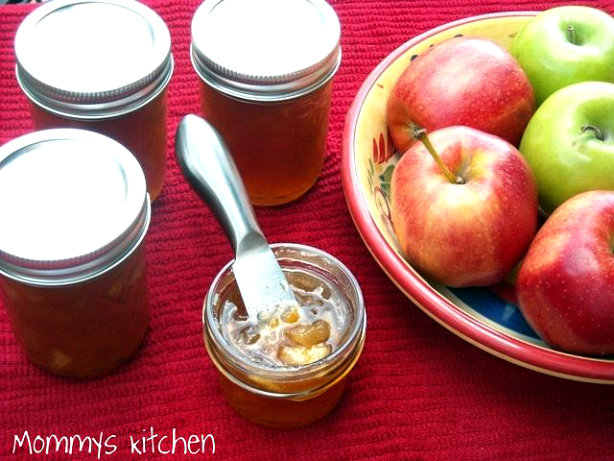 Mommy's Kitchen - Recipes From my Texas Kitchen: Apple Pie Jam - I Smell Fall! Apple Pie Jam - I Smell Fall! 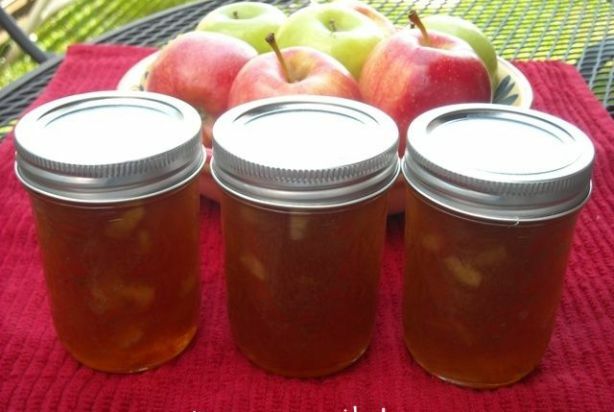 Fall Apple Pie Jam perfect on toast, biscuits or used as a topping. 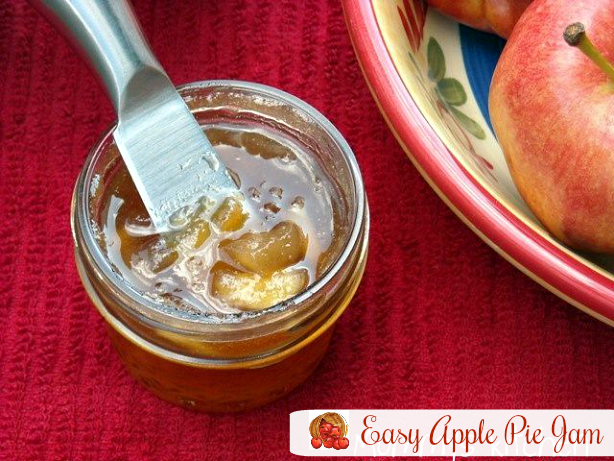 All the flavors of Apple pie filling in a deliciously easy jam. A couple weeks back I had mentioned that I wanted to get a jump on my Fall canning. I started with Apple Butter and today's recipe is for Apple Pie Jam. I found this recipe on Coleen's Recipes a couple months back. 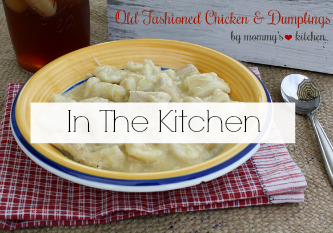 This recipe was super simple to follow and taste just like apple pie filling. I used a combination of granny smith and gala apples or roma, I can't remember exactly. My local Walmart had bagged apples for 1.50 each, so I grabbed two different varieties. We have a pick your own orchard here in North Texas (Henrietta Creek )n but the winds have damaged the apple trees so, there's no picking this year. The kids were really disappointed that we couldn't go apple picking, but there's always next year. I managed to can the apple butter and this delicious apple pie jam canned all in the same weekend (high five for me). 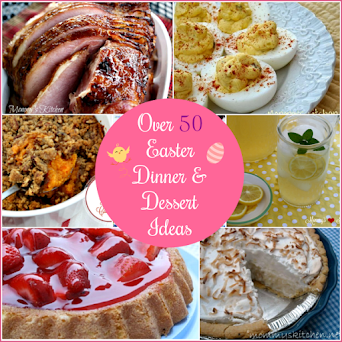 I still have Pumpkin Butter, Homemade Applesauce and Apple Pie filling on my list. Hopefully I will get around to making all of them. To start, peel and dice apples and place in a large pot.Cook apples, water and butter over low heat, stirring until apples are soft but not mushy. Stir in pectin and bring to a full rolling boil, stirring constantly. Add both sugar and cinnamon and bring back to a boil (220 degrees use a candy thermometer), stirring constantly. Once the mixture comes to a full boil and reaches 220 degrees, boil for one full minute. Remove from heat and skim off foam (if there's any). Pour into hot sterilized jars, leaving ¼” head space. My photo above shows that I am sterilizing my jars, removing to the cloth covered counter. Add sterilized water to a separate bowl with the lids and rings. Using a canning funnel start filing your jars. 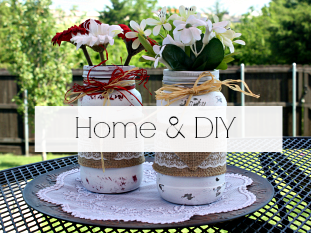 Fill jars, using a cloth wipe any remaining jam from the rims (or the lids wont stick). Remove a lid from the hot water place on jar and add a ring. Process in a hot water bath. 10 minutes for pint size jars and 5 minutes for half pints. Remove to a cloth covered counter until the jars pop and check to be sure the lids are sealed. This jam is so yummy and it really does taste like apple pie. Cook apples, water and butter over low heat, stirring until apples are soft but not mushy. Stir in pectin and bring to a full rolling boil, stirring constantly. Add sugars and cinnamon and bring back to a boil (220 degrees use a candy thermometer), stirring constantly. After the mixture comes to a full boil and reaches 220 degrees boil for one full minute. Remove from heat and skim off foam (if there is any). I think you should give a jar of this away. To one lucky reader. Who just happened to suggest it. I love fall as well, this recipe looks so wonderful! I love the idea. it's apple fest weekend in northern wi, so I will definately try this recipe! It looks delicious! 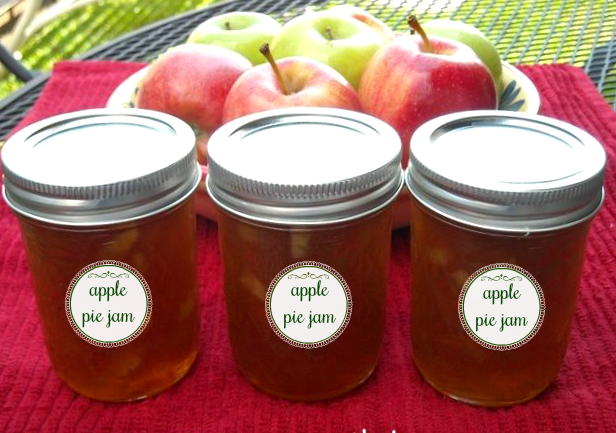 I love the flavor of apple pie, and it seems like so much fun to have it in jam form. Hi everyone this is a good recipe to use for all the in season apples. Anne I have added you to my blog roll. I think I told you on a comment on your blog but then I forgot so thanks for coming by again. I Immediatly remembered. your caramel apples look awesome. Sherri you made me laugh as soon as I saw your comment. Stephanie I think it is actually apple pumpkin butter. But I will post it as soon as i make it. I've only ever attempted strawberry jam once... but, this looks YUMMY! I'm going to have to see if I can find my jelly jars...and canner... things are still here and there from our move 6 months ago! mmmm, that sounds awesome. I love apple pie things. honey a few weeks back. I will have to try your apple pie jam, looks awesome. Love your blog! You inspired me to try canning this weekend. My mother and grandmothers always canned but I never have. I did one batch of your apple pie jam and went to the store and bought the stuff to do strawberry jam. I was so excited to hear those lids pop every time. I can't wait to try them both. Thank you for the inspiration. How wonderful Sarah. 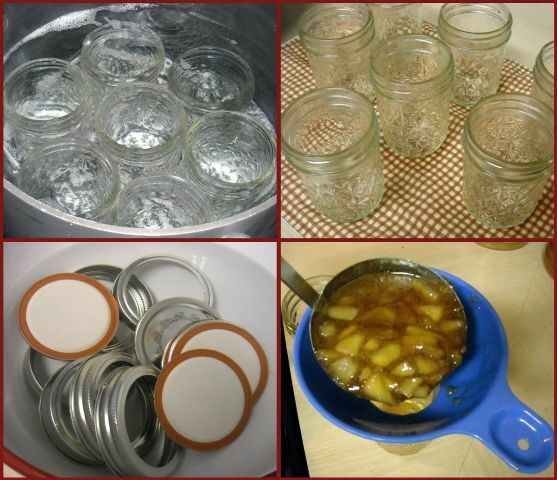 Canning isnt as hard as we think it is. I love how the old ways are coming back. I have loved to can for so long. I am doing a batch of applesauce today. Thanks for stopping by and letting me know. Keep up the canning. How sad the apple trees are damaged! Well, I am sure your apple pie jam still is amazing. It screams Fall to me. 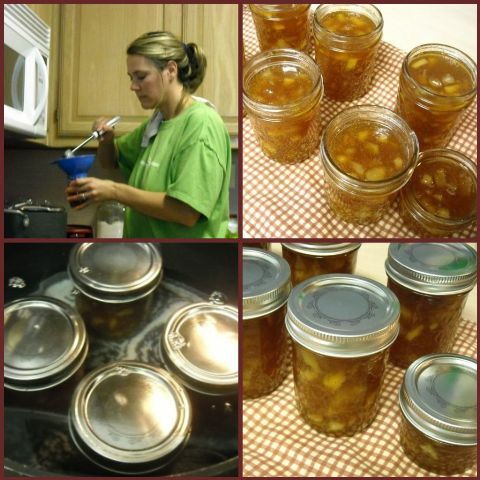 I have made 2 batches of apple pie jelly and YES, it taste exactly like apple pie. I am guilty of eating it by itself in a small bowl!!! Soo good! I have managed to give a few jars of jelly away to friends...one friend stated that she almost went into "A Coma of Deliciousness!!!" I take it she liked it!!! Thanks for sharing this recipe!!!!!!!!! This looks delicious. 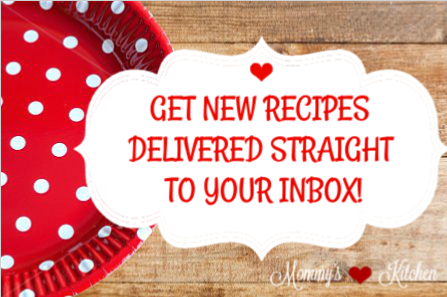 I found you through the Foodie Blogroll and I will definitely be back to check out more of your recipes. 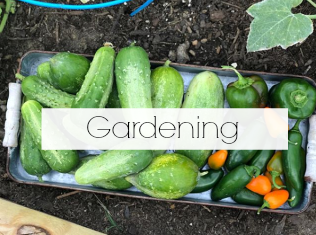 I just found your blog a little while back and it is great! On the apple recipes, I am thinking about using deer apples instead of granny smith. Deer apples are reg. apples but 2nd , they have a bruise or something. That should still work, or I am hoping it does. ? Hey there, I'm new at the canning and can't seem to stop! My apple trees didn't share with me this year but they will next year. I have so many pears to work with, the keifer pears. Hard ones but very yummy! The large adult trees are loaded and need some attention! HA! Can someone tell me how long this will keep? Some of the ones I have saw say that it is only good for 3 months and that is if you refrigerate it. Jam that has been properly canned is good for 1 year. Stored in your pantry. This recipe sounds delicious! Do you know if there's any way of making it with less sugar? How would you do it? I'm not sure how you would make the jam with less sugar. You might have to research it on Google and see what you can come up with. I know most homemade jam recipes call for a good amount of sugar, so sorry I can't be of more help. A 1/2 cup water doesn't seem like very much but went ahead and made a batch this morning following your recipe. I used all granny smith apples (8)cause that is what I had here. You say you got 7 1/2 pints to where I only got 7 -1/2 pint jars of the canned apple filling. I must say tho, it sure is yummy. Had just a tad left over and oh, it's sooooo good. Will be making this again. use honey in place of sugar, use 7/8 cup for every cup of sugar, and don't change the other liquids. Which sugar are you substituting? Brown or regular? If you are using 7/8 cup of honey for each cup of sugar that's a lot of honey when you are substituting both regular and brown sugar. I have made this jam four times in the last week. IT IS AWESOME! People keep asking for more jars and i'm struggling to keep any for myself. 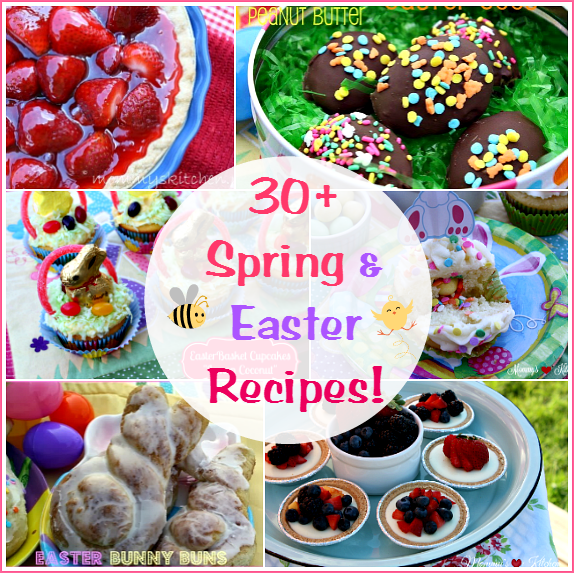 This is definitely on my list of favorite recipes! when it was time to add the pectin their wasn't any juice. Is this normal ? I used all granny smith apples.With no juice it was hard to see a rolling boil so I added small amount of water. Had cooked them in the 1/2 cup of water and it was all gone. The pectin is added while the apples are soft, but not mushy. Then the sugars are added and brought to a boil. This is my first time making this and I LOVE LOVE LOVE it only next time I will cut down the sugar it is just a bit to sweet for my liking Awesome over ice cream. 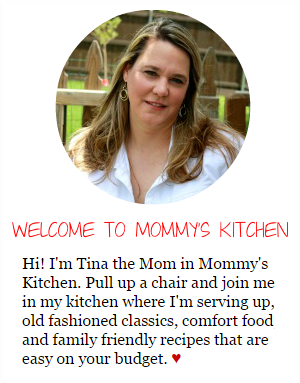 Hi Tina, what kind of pectin did you use. I always use the 100% natural sure gel in the yellow box, will this work? Thank you! I am not sure what I did wrong but I only got 5 half pint jars! This was my first time ever making jam so I hope it turns out! Just curious can you do a double batch of this recipe? I was going to but my father in law said it may not set up right if I did it that way! Please let me know! I just made your apple pie jam and it is delicious, but the consistency is more like jelly than jam. I think it was because I let it boil for several minutes trying to get the temp up to 220 degrees as the recipe directed. Given that there is fruit pectin added to the apples, it seems like it should only be allowed to boil for one minute after you have added the sugars and had it come to a boil. I'm definitely going to make this recipe again, but I'm going to try boiling it for only a minute after it comes to a full boil to see if it results in a more jam-like consistency. You're welcome try try it that way, but I did the whole add the pectin and let it boil for 1 minute and the jam did not set up. It was quite runny and I made it twice. Since then I have done some online research on making jams and it says that jam needs to get to 220 degrees for it to set up. I found this same issue with my strawberry jam because it was not setting up after adding the pectin and boiling for one minute. I just made 3 batch of Apple pie jam last week and it set up like jam/preserves. Not sure after all that cooking why it would be runny. There are no stupid questions, right? I haven't canned in 30 years. Have no canning equipment. Can you freeze this jam? You're correct no question is ever stupid. You can certainly freeze the apple pie filling. Freeze the filling in large freezer safe ziplock bags and make sure all the air is removed. You can also vacuum seal the filling as well. I hope this helps.